These days, photography has become something ordinary and part of everyday life. People take photos of mundane subjects and scenes as a record of daily life. However, some artists still strive to discover the artistic potential in photography. Lee Jung-jin is one of them. At her solo exhibition "Jungjin Lee: Echo," held at the National Museum of Modern and Contemporary Art (MMCA), Gwacheon, Lee unravels her work spanning over three decades, taken, developed and printed on "hanji" (traditional Korean mulberry paper) by the artist. Bartomeu Mari, director of the MMCA, introduced Lee as a pioneer who expanded the artistic potential of contemporary Korean photography by developing a unique visual language. "Her works are difficult to simply define as photography. Her works reveal traits of handicraft and painting. Boundaries are often blurred and possibilities are pushed to the extreme," Mari said at a press preview of the exhibit, Tuesday. 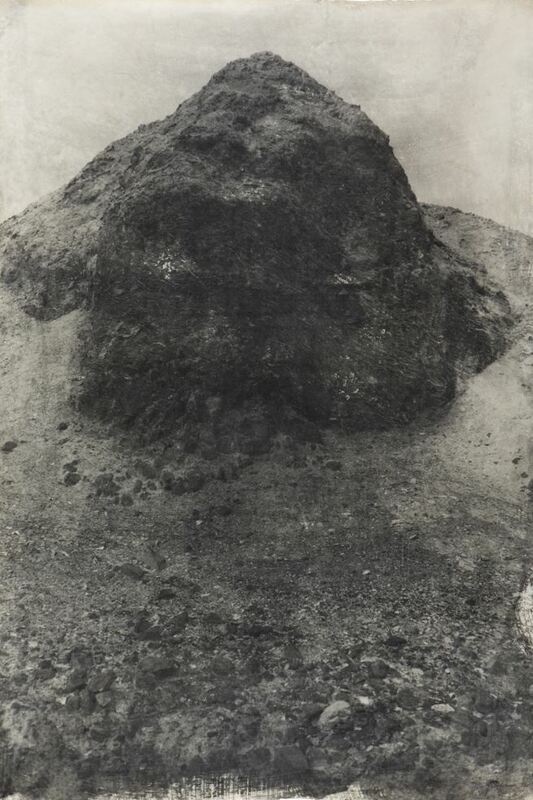 Eleven analog photography series -- including "American Desert," "Wind" and "Pagoda" -- are on view at the exhibition, all without frames to maximize the unique texture of Lee's hanji photographic prints. "I have been dividing my time in Korea and the States for the past 30 years and mostly worked in the States. I am glad to communicate with Korean audiences with this exhibition," Lee said. The artist majored in craft from Hongik University, but her interest shifted to photography. She worked as a documentary photographer for two years in Korea before heading to New York University to study photography further. Lee experimented on various techniques of photography and discovered hanji for print. She applies sensitive emulsion on hanji and prints photos in a darkroom with her own hands. Such handicraft brings unique aspects to her photos. The exhibit is held in collaboration with Fotomuseum Winterthur, a photography specialty museum in Switzerland. Thomas Seelig, curator of Fotomuseum Winterthur, said Lee's works stand out in the world where people are surrounded by digital, flat and fluid images. "We are now searching for materiality and texture -- things created by hand. Important characteristics of Lee's works come from mistakes, unrefinement and all kinds of irregularities. While walking this exhibition, mind that all works have gone through the artist's hand to prepare," Seelig said. Desert was one of the major subjects of Lee, who produced three desert photography series. Instead of capturing the extensiveness of the desert, Lee captured imagery of the moment through fragmented objects. "I empathize with the desert, but it was difficult to capture that vastness within the frame. So I sought the way to connect in and outside the photographic frame and the hanji print turned up during experiments," the artist said. "For early works, I tried to capture my empathy in the scene in my eyes. I empathize better with camera than brush, so I am a photographer." "American Desert III" series is the only series that features a human body, which are in fact the body parts of the artist. She used a small camera that captured performative aspects. "The camera took the picture while I could not control frames. The energy of the desert inspired me to start something new," Lee explained. The most abstract works from the "Untitled," "Wall" and "Ocean" series are located at the very last part of the gallery. "Here, images are not clear of what they depict. It is just a photographic image itself and they reveal the texture of hanji paper perceiving photographs most clearly," Seelig said. The exhibit runs through July 1. Admission is 2,000 won. For more information about the exhibition, visit mmca.go.kr or call (02) 2022-0600. Visit jungjinlee.com for more information about the artist.